The Cruise collections often get overlooked but they make for glamorous, yet comfortable clothing for those globe trotting during the cold winter months. Chanel unveiled their Cruise collection yesterday at an airport hanger complete with Chanel 601 Jets. It brought a whole new meaning to “jet set.” Full story & more pictures after the jump . . .
With that loudspeaker pronouncement, Chanel’s Cruise presentation took off, literally. Two Challenger 601 jets pulled up to Hangar 8 at Santa Monica Airport on Friday night, the doors popped open, and the models stepped out in a tour de force show that only Chanel could have pulled off. The stage was made up to look like an arrival lounge with three levels of white banquettes and a giant arrivals monitor announcing Karl Lagerfeld’s landing in Los Angeles. 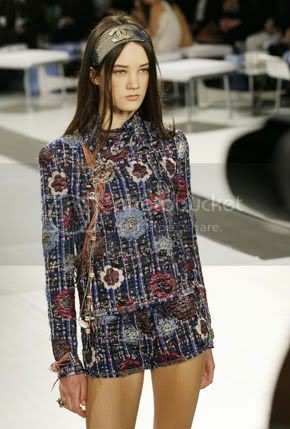 The 60 or so looks were a lighthearted take on the private travel theme, from Chanel’s version of a stewardess getup to a cozy floor-length cardigan. So did the 500 guests, who included Demi Moore, Mary-Kate and Ashley Olsen, Claudia Schiffer, Victoria Beckham, Jessica Alba and Lindsay Lohan. “That was so cool, no?” gasped Diane Kruger, who had jetted in from the Cannes Film Festival.